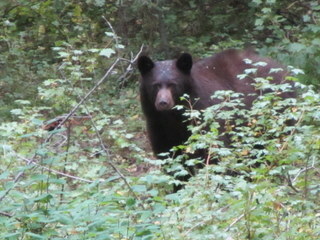 During my recent elk hunting trip, we had a couple black bear encounters. This bear was feeding on currant berries very close to the trail I was hiking on. I accidentally spooked the bear as I walked up and it ran out about 20 yards, turned and watched me. The wind was blowing from the bear toward me, so it couldn’t smell me (when a wild bear smells a human, it will usually turn and run). This bear just sat there watching me, so I took the opportunity to get some photos. People ask me, “weren’t you scared?” and oddly enough, I wasn’t the least bit nervous. Bears are usually shy animals that just want to be left alone and since I didn’t see any cubs around, the situation felt safe. I typically see several bears each year when I’m archery hunting. One year I was mountain biking out of a logging area and came across two bear cubs and their mother (she’s just out of the picture to the right, behind a tree). When I saw the bears, I immediately stopped and just stood there quietly. As long as the cubs don’t freak out and start bawling, a situation like this turns out fine. Get between a mother and her cubs and you could end up being a chew toy. Luckily, that hasn’t happened to me, but I think about it every time I hike in the dark. Over the years, I have had many bear encounters and all of them were peaceful. 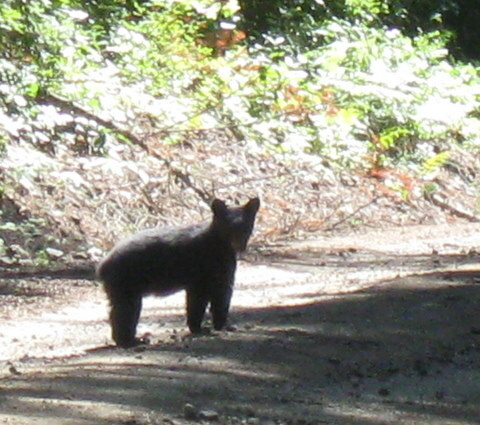 However, I’ve talked to multiple hunters who have had problems with bears. One friend was bowhunting elk in New Mexico, walking along making cow elk sounds, and had a bear come running in aggressively with drool pouring out its mouth, thinking it was going to have elk for dinner. My buddy yelled, backed away, waved his arms, but in the end, had to shoot the bear to keep it off him. These things do happen and I carry a sidearm in the woods in case I end up in this sort of man vs. claw encounter. I too have had bears come in to my elk calling, but they’ve always moved off once they realized that I was not an elk. Bears are naturally curious, which can also lead to some up close encounters. The bear encounter in this video is not as uncommon as you might think. In a separate incident, one of my friends had this happen to him while he was in a treestand with a video camera. He ended up whacking the bear on the head with his camera tripod to get it to go back down the tree and leave him alone. When black bears get agitated, they snap their jaws together repeatedly, making a popping sound. Sometimes they will also “bluff charge” where they stand on their hind legs, then jump down on all fours and run toward whatever is making them uncomfortable. I’ve never been charged, but I’ve been snapped at and it’s a little creepy. Snapping means, “move back, buddy” and it’s not the time to hang around and take photos. When I hear snapping, I look for an exit route. While bears can be unpredictable and certainly have the capacity to hurt you, they usually don’t if you respect their space. I really like seeing them in the woods. They add an extra element of wildness and serve as a reminder that we aren’t always at the top of the food chain. This entry was posted in Bears, Hunting and tagged bear, black bear, bowhunting. Bookmark the permalink.